Welcome to Bronx Arena High School! It is our pleasure to have you join us in this exciting and unique approach to 21st Century education. Bronx Arena opened to our first students in 2011. The school is a collaborative partnership among the New York City Department of Education, SCO Family of Services, and Diploma Plus. Each of these entities brings to the school a long history of academic and social success as well as an understanding of the changing needs of urban youth. Staff at Bronx Arena approach students and their learning from a Youth Development Perspective. We will not only help you to uncover personal strengths but will hold you to high expectations that you can and will meet both academically and socially. In turn, students who choose to attend Bronx Arena High School accept and work through the challenges that are associated with graduation from high school in New York City. 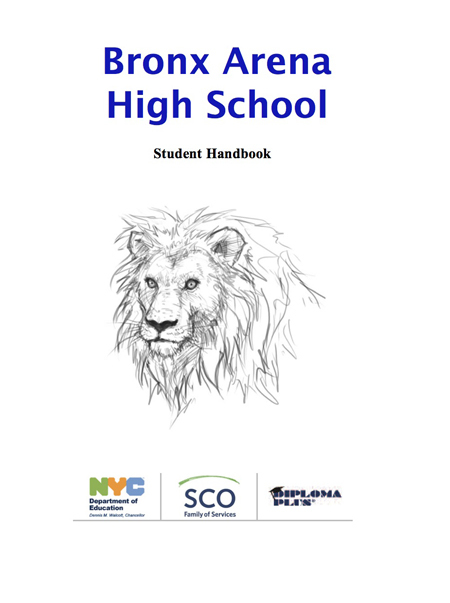 The Mission of Bronx Arena High School is to support and empower over-aged, under-credited students to achieve academic success so they can earn a high school diploma and graduate prepared to enter college, post-secondary training, or a career path that matches their personal and professional goals and aspirations. Bronx Arena’s graduates will be self-motivated and confident, allowing them to expand and express their own talents. We have implemented a partnership model, where the Department of Education provides the school’s academic program and SCO Family of Services provides comprehensive social services and supports to Arena students and their families. The aim is to develop students’ core intellectual and behavioral skills to prepare them not just to graduate from high school but also for the learning skills that students will need to succeed in post-secondary education, careers, and adult life. Blended learning is a style of education where students are provided digital coursework combined with in-class instruction and activities with the instructor. Students are able to gain control of accessing the knowledge and information in their course through the digital material. In class, students are then able to receive small-group and one-on-one instruction with the teacher. Students will also be expected to engage in discussions, group work, and peer learning. The technology allows students to access a larger variety of coursework and materials in order to gain a richer educational experience. The technology also allows students to access their coursework 24/7/365. Finally, by learning to access information and navigate a digital world, students gain skills that will enable them to be better prepared for college and career in the 21st Century. Bronx Arena prides itself on being at the forefront of increasing students’ access to technology in their education. Students at Bronx Arena are provided with a laptop computer in each of their classes. The computers are equipped with the latest programs and applications ranging from word processors to multimedia editing software that allow students to produce a variety of work. Students are also given Internet access throughout the day, providing them with access to an entire world of knowledge and education. Bronx Arena is one of 125 schools participating in the NYC DOE iZone: iLearn NYC program. This program gives students a “one-stop shop” to view and complete all courses and course work including assignments, tasks, projects, and challenges. Students can earn Math elective, Science elective, or Technology elective credit by enrolling in a course offered at Bronx Arena called “Connected Foundations.” Connected Foundations is an innovative, credit-bearing technology course focused on digital literacy and college and career readiness. The course resides in a social and fun community learning space DIG/IT (“dig it”) where students learn about digital citizenship as they Live, Learn, Earn, and Play online and get ready for college and careers with relevant, in-demand skills. Upon successful completion of the course, participating students receive a free computer from Computers for Youth and become eligible to purchase discounted broadband service for their home. Students who entered high school in 2007 must pass 4 of 5 with a 65. Students who entered 9th grade in 2008 must pass ALL Regents with a 65 or better. All Students at Bronx Arena High School are expected to pass all Regents exams with a score of 75 in order to prepare for college. 3.) In addition to 44 credits and 5 Regents, Arena students must complete a portfolio and complete a college application in order to graduate. Advocate Counselors help support students throughout their journey at Arena. Encouraging positive relationships among the student and the student’s family, staff and teachers, the Advocate Counselor helps the student make choices that are well informed and different from those that they may have made in the past concerning attendance, academic planning and achievement, and post-secondary planning. Each student is assigned to an Advocate Counselor upon admission to the school and it is our expectation that this Advocate Counselor will remain involved with that student throughout his/her tenure at Bronx Arena. Advocate Counselors greet students in the morning and take attendance as they enter the school. If a student does not arrive at school on time, the Advocate Counselor will make active outreach attempts in order to locate the student and encourage attendance. The Advocate Counselor will continue these outreach efforts throughout the duration of a student’s absence from school. Efforts will include conversations with and home/field visits to parents, employers, and significant adults. After three consecutive absences, the student’s Advocate Counselor will make a home visit. The Advocate Counselor is ever mindful that consistent attendance at school is the cornerstone to academic success at Bronx Arena. All students are required to actively participate in Advisory Group meetings facilitated by their Advocate Counselor. The purpose of Group is to help students to understand and take responsibility for their personal academic trajectory toward graduation, to overcome obstacles that have interfered with a successful high school experience and to assist each student in developing a satisfying post-graduation college and/or career plan. Group allows each student the opportunity to acquire information as well as to experience feedback and advice from both peers and adults in the school community. Informational sessions may be integrated into the group experience by involving outside providers in particular areas that are meaningful to adolescents. Advocate Counselors are available to students as needed throughout the school day. In addition, students meet with their Advocate Counselor for a private counseling session approximately twice per month. These sessions serve to support academic progress, assist with personal issues that impinge upon that progress, provide referrals as needed to community services, work through issues that arise within the school community, internship site, family and personal relationships. Counseling sessions help students to focus on planning for life beyond high school in terms of career and college. Advocate Counselors program students for the classes and exams that they require in order to graduate. They continually work with students to ensure that they are well informed as to their personalized plan toward graduation and monitor progress toward that end. Advocate Counselors are responsible for maintaining and updating students’ credits as they progress toward graduation and for communicating these achievements with families and significant others. Bronx Arena is a community that is created and maintained by staff students and families. Parents/guardians are involved with Bronx Arena from the point of intake and are well informed by the Advocate Counselor about all student progress in school throughout the year. Parents are immediately notified of any lateness, absence or misconduct. They may be invited to the school both for positive outreach and for academic and discipline interventions. If there is a conflict between a student and another student, a teacher, a staff member, or an administrator, the Advocate Counselor will work with the student to come up with the best possible solution to resolve the conflict. A meeting, called a STAC, may be called, to allow the student, teacher, Advocate Counselor (and perhaps administrator) to engage in a mutually respectful process of conflict resolution. Anyone within the school community may request that a STAC convene. When you begin your education at Bronx Arena, your Advocate Counselor will work with you to develop your career and employment goals. Your counselor and our Internship Coordinator are available for assistance in finding and keeping part-time employment and planning for post-graduation. Paid internships, which will help build important career skills, are available through the Internship Coordinator. There are a variety of different fields including working with children, in offices, at cultural institutions, with animals and with the elderly. In order to participate in the internship program, students must attend school regularly and be in good academic standing. Typically, a paid internship is 10 hours per week and takes place after-school and/or on weekends. The Internship Coordinator is available to assist you in various areas of career development. This includes developing a resume, preparing for interviews and completing job applications. Workshops can be in a group setting afterschool or individually by appointment. Working papers are required if you are planning to work in a paid internship or in another job and you are under the age of 18. To apply for working papers, see the Internship Coordinator and provide the following documents: copy of your birth certificate, copy of your social security card, and a doctor’s note stating you are able to work. Students and staff work to make sure that Bronx Arena is a safe and respectful learning environment. Behaviors that put safety at risk will not be tolerated. Fighting and possession of drugs are non-negotiables in our community. Attendance is the cornerstone of the Arena community. Students are expected to come to school every weekday on time and remain in the building until the completion of their schedule. Advocate counselors monitor attendance and notify parents of lateness and absence each day. A home visit to the student and family is scheduled in situations of prolonged absence from school. Efforts are directed toward returning the student to active attendance in most situations. When special circumstances are evident, arrangements for continuation of academic work at home (or hospital, etc.) can be made due to our electronic curriculum delivery. These arrangements are made in cooperation with the student, teacher, parent and administration. The Chancellor’s Regulations require that prolonged unexcused school absences by students who are legally considered to be minors will be reported to the New York State Central Registry for follow-up by NYC ACS. Active attendance at school is required in order to progress through the Blended Learning curriculum toward graduation. If you are going to be late or absent, notify your Advocate Counselor. Students are expected to participate in all classes (including Advocate Counselor Groups and Future Is Now). Cutting classes is not acceptable. If a student cuts class, a series of progressive discipline will be in place in order to assure attendance. Late arrival is disrespectful to the classroom environment. If a student demonstrates a consistent pattern of arriving late to class a series of progressive discipline will be in place in order to assure attendance. Bronx Arena has high expectations for their students both in and out of the classroom. In the classroom students follow the expectations that are established by the teacher. Expectations include – but are not limited to – participating in class, completing assignments, and behaving in a way that does not interfere with the education of other students. If a student has a particular problem that interferes with learning, the expectation is that the teacher will contact the student’s Advocate Counselor and/or the student will be issues a pass to see his/her Advocate Counselor to discuss the problem. Failure to comply with classroom behavior policies will result in a series of progressive discipline in order to assure classroom stability. -Use of computer network and online communications is a privilege that supports teaching, learning, and research. -Students, parents, faculty, and staff at Bronx Arena High School will have access to web based educational resources in compliance with local, state and federal laws. -Authorized users shall be ultimately responsible for all activity under their account and password. Accounts shall be used only by the authorized user for the purposes specified. Use of an identity or password other than the user's own is prohibited. -All network users shall adhere to the rules of copyright regarding software, information, and the will acknowledge authorship. Re-posting communications of a personal nature without the author’s permission or bulletin board messages without proper attribution is prohibited. -Any use of computers for illegal, inappropriate, obscene, or pornographic purposes is prohibited. -All use of computers for the promotion of an individual’s personal or political agenda or commercial efforts is prohibited. -Use of offensive or inflammatory speech, profanity, or obscene language is not permitted at any time. -Users shall not intentionally spread computer viruses, vandalize the data, infiltrate systems, damage hardware or software, or in any way degrade or disrupt the use of the network. Any attempts to degrade or disrupt system performance will be viewed as criminal activity in accordance with applicable DOE regulations and applicable State and Federal law. Students are expected to be able to participate in class without the distraction of food and beverage. All classrooms at Bronx Arena are equipped with laptop computers for each student that require careful care and maintenance. Food and drink are not allowed near electronic equipment at any time. Positive communication and respect is key to determining success within the Bronx Arena community. The expectation is that positive communication will be used by all community members at all times when expressing views, needs, concerns, criticisms, and to give feedback. We avoid using language, gestures, and body language that offends others. This is an educational environment which focuses on facilitating the development of positive communication skills within and among students as well as staff, to help students succeed in different social and professional environments. Any language that undermines this focus will not be tolerated and will result in consequences in correlation with the severity of the incident.